I am melting as I write this. Nice Los Angeles warmth suddenly evolved into uncomfortably hot this week, and our house feels like an oven. Fans are on, water is being guzzled, and I have the desire to take cold showers at least twice a day because I feel so sticky. But if this means enjoying a few more days of the summer season, then bring it on. One of the treats of the end of summer is that figs are in season! Here in Southern California, fig season is from September to October. Ever since having a fig tree in our previous house’s garden, I take special delight in fresh figs. They are sweet and plump, with a wonderfully unique flavor. Figs are versatile, used in both sweet and savory dishes. When I saw this fig and thyme recipe in Bon Appetit Magazine, I was immediately intrigued. The jam has such a simple, yet perfect combination of honey, figs and thyme. We grow lemon thyme in our garden, so I used lemon zest to bring out the suble citrus notes in the jam. For anyone new to making jam, this is a quick (it takes less than 20 minutes! ), easy recipe to start with. The jam can be kept in the refrigerator for up to 2 weeks, and is a perfect topping on cheese & prosciutto, warm toast, or plain yogurt. Place honey in a medium saucepan. Bring to a simmer over medium heat. Add lemon zest, thyme sprigs, and pinch of salt. Simmer mixture for 1 minute. Add figs. 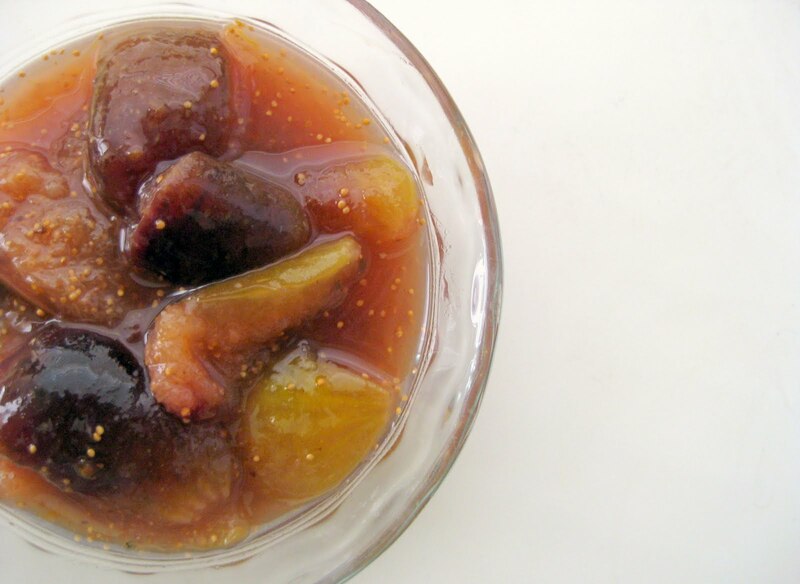 Continue to simmer, gently stirring occasionally, until figs are soft but still hold their shape, about 5-10 minutes depending on firmness of figs. Let jam cool. Transfer to a jar, and chill.